01 December, 2017. Dundalk, Ireland. Dr Keith Thornbury from the Smooth Muscle Research Centre in Dundalk Institute of Technology (DkIT), was invited to attend an exhibition and reception in the European Parliament, along with Professor Lorraine Martin from Queen’s University of Belfast (QUB) and Professor John Lockhart from the University of the West of Scotland (UWS). 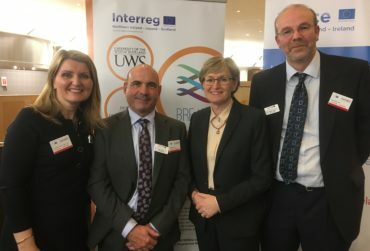 The purpose of the event was to raise awareness of the impact of EU funding, delivered via the PEACE and INTERREG Programmes, on the region (including the Border Region of Ireland, Northern Ireland and Western Scotland). 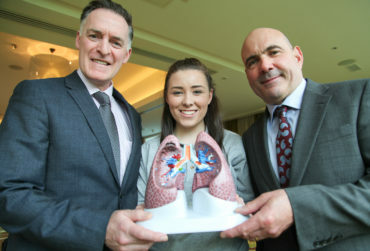 Dr Thornbury and colleagues were invited in their roles as leaders of BREATH, a €7.7M INTERREG-funded cross-border collaboration designed to train new young biomedical researchers in the fight against lung disease. 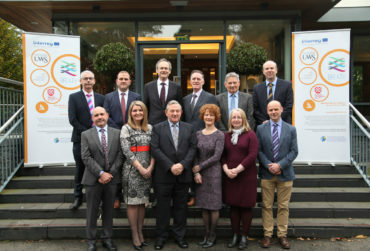 Photo Caption: From (left to right), Prof. Lorraine Martin (QUB), Dr Keith Thornbury (DkIT), Mairead McGuinness, MEP, Vice President of the European Parliament and Prof. John Lockhart (UWS).